As fire and rescue services across the UK gear up for the busiest weekend of the year, The Fire Fighters Charity is calling upon members of the public to attend organised displays and donate in support of injured firefighters, rather than risking accidents and injury with fireworks at home. 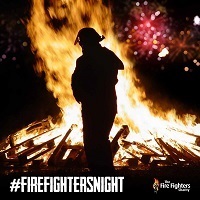 Bonfire night is traditionally one of the busiest nights of the year for fire and rescue services throughout the UK as they are called to attend up to 50% more fire emergencies on or around November 5 than on any other night of the year. Worryingly, studies have also found that the autumnal celebration sees emergency service workers subjected to increased levels of violence and hostility while carrying out their duties (source: Chief Fire Officers Association). Rebranding the November 5 celebration as Firefighters Night, the Charity – which provides rehabilitation and psychological support to firefighters and their families – helps over 5,000 people a year, including firefighters injured on duty or who require mental health support to come to terms with the distressing nature of emergencies they may attend. The Charity has launched #firefightersnight as a social media campaign and is asking members of the public to text FIRE to 70660 to donate £3. Funded almost entirely by donations, and facing an increasing demand for its health and wellbeing services, The Fire Fighters Charity needs to raise around £9m a year to keep its doors open. Support from the general public, especially around this time of year, is therefore crucial. Dr Jill Tolfrey, Chief Executive of The Fire Fighters Charity, said: “First and foremost, staying safe on Bonfire Night is vital for everyone and organised displays are by far the safest way to enjoy fireworks.